You want to make sure that new versions of your Fabasoft Cloud-based solution are checked daily and intensively for correctness in your CI, or ensure that the major use cases work as designed after an update to the latest version of the Fabasoft eGov-Suite: Fabasoft app.test helps you to perfectly automate your user acceptance tests. Extensive tests can thus be executed within a few minutes. 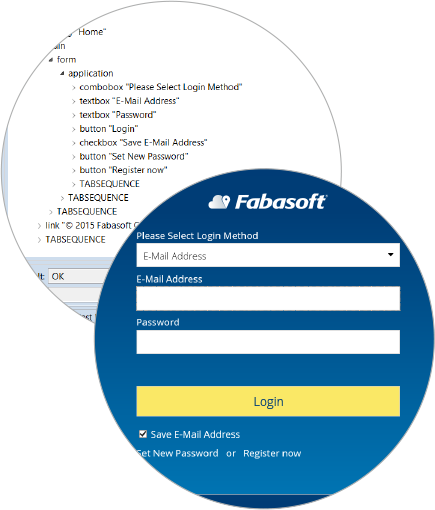 You free your employees from the tedious and error-prone task of manually working through test plans by letting the Fabasoft app.test player do the clicking. Fabasoft app.test Studio is a testing tool for automated quality assurance. 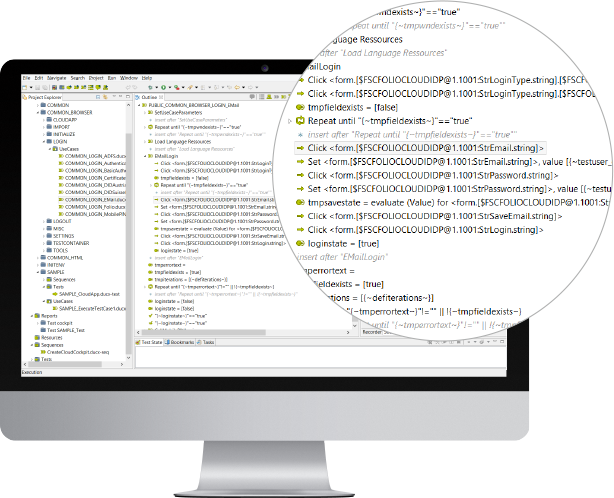 It supports the entire testing cycle – from the management of test projects, the recording and extending of tests up until the analysis of reports. Fabasoft app.test Studio prepares the entire automation and integration of tests into a CI system. You are always in control, regardless of the complexity of your test projects. Clicking an error message in the test player brings you to the test recorder, allowing you to immediately analyse and solve any problem that occurs. It has never been easier to debug tests. The Fabasoft app.test recorder is the tool used to efficiently create tests. Based on the structure of input and control elements (control tree) of the web application, you can carry out actions (for example clicking a button), store values in test parameters, carry out validations, etc. Tests are recorded by using the tree view of the available control elements (fields, buttons, links, etc.). This control tree view allows the execution and recording of actions, statements and validations. The context menu of the tree view lets you seamlessly insert test statements and new test modules. These test steps are immediately executed in the web application and recorded in the test. With options such as “IF statements”, “timeout” definitions or “wait” statements, test steps can be optimised to fit specific scenarios. Finally, you fine-tune your tests by validating the test criteria with "Validation" statements, which adds even higher quality to your software. 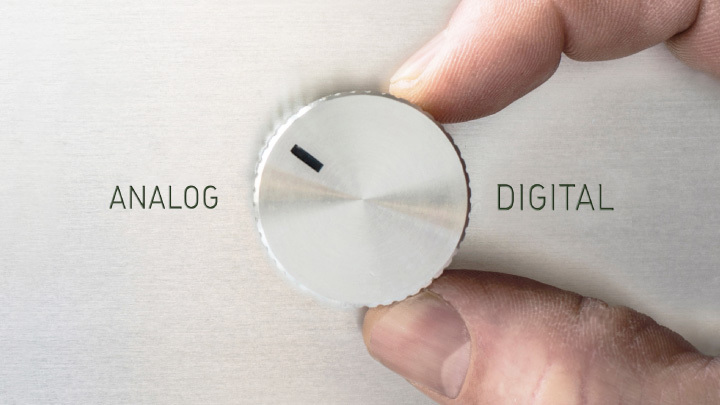 The “Point and click recorder” makes test recording as easy as working with the application. You do not need any prior experience in creating tests to use this quick and comfortable way of recording tests. While you click through the web application, the actions thus carried out in the web browser are recorded and stored as “execution” in the test. You can both interrupt and continue recording at any time. The Fabasoft app.test player allows for tests to be run automatically. When using the test player in Fabasoft app.test Studio, the executed tests can be debugged immediately to solve problems right away. Both recorded as well as imported tests can be played. If a test needs to be modified, for example in the case of an error, it is possible to seamlessly switch to the recorder and refine the test. Afterwards you can switch back to the player and either continue playing the test or restart it. Multilingual environments often require redundant acceptance tests when operating on the GUI. Fabasoft app.test solves this problem by providing translation files with multilingual strings. When a test is recorded, the texts of the web application are examined. The statements are then recorded independent of language. The tests can therefore be replayed in all available languages. 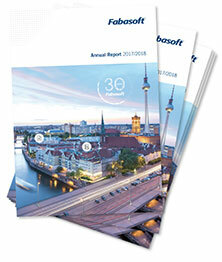 Furthermore, the translation files can be extracted from the Fabasoft Cloud or the Fabasoft eGov-Suite. The overview and detail reports generated with Fabasoft app.test are not limited to telling you that something does not work. In the detail reports, each error comes with additional information recorded at the time the error situation was logged. A screenshot of the user interface, the relevant HTML code or the control structure of the web application are examples of such information helping you quickly find the reason for the error. 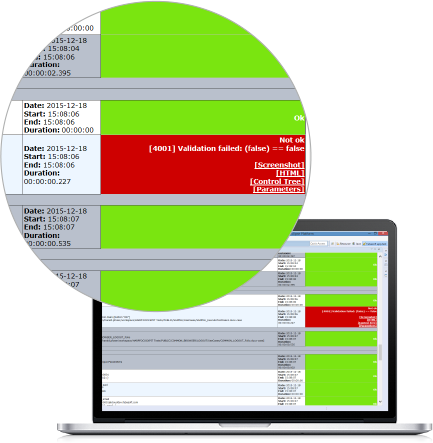 Fabasoft app.test delivers the detailed test results in XML format and transforms them into HTML reports. A transformation into a JUnit report can be used to process the test results in a CI environment. The Fabasoft app.text console player is used to integrate automated acceptance tests into your build cycle. Steered by Apache Ant tasks or batch scripts, the automated tests are distributed on your CI management server across your test clients. The tests can be started in a particular order and with different users. On the test clients themselves, the tests are carried out by the Fabasoft app.test agent. The agent controls the tests on the workstations in the required web browsers. With the Fabasoft app.test commander, your tests may include steps for preparing the test environment on the client (for example installing required programs or providing files from a file share, etc.). Finally, the Fabasoft app.test console player collects the results of all test clients and generates reports in XML format (or transformed to HTML or JUNIT) centrally on the management server. With these features, Fabasoft app.test is seamlessly integrated into your CI and considerably supports the quality of your software solution. Apache Ant tasks allow for a direct integration of Fabasoft app.test into the build process. By help of Apache Ant tasks the tests are executed remotely on the test clients with the console player, the test reports are generated and emails are sent out to your developers.